I was working my way through the Android developer documents at developer.android.com and had a little trouble getting the example code to run without any alterations in the emulator and frankly, you have to know this stuff if you’re going to code anything serious on the android platform. 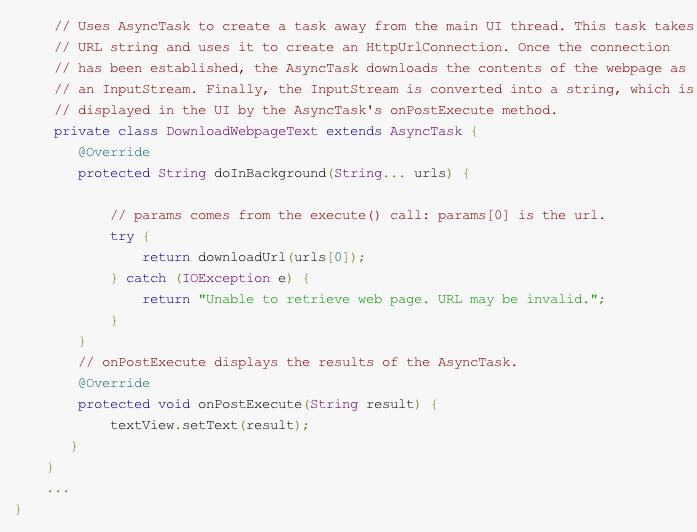 AsyncTask’s Generic Types specifies three input types, I guess you need to modifiy the above code to look more like mine to get this to work. Params, Progress, and Result. 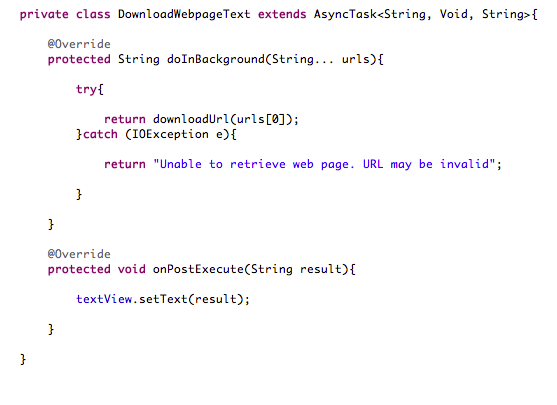 so instead of just having the DownloadWebpageTask method extend only AsyncTask i decided to key in the params using <String, Void, String> for the parameters. Now the developer docs says you can just insert “Void” in all the fields. I used a String data type for the Params… as the docs say this will be the type of parameter sent to the task upon execution. For Progress I inserted the optional “Void” parameter and then used the String data type for the Result as I knew the function would be returning a string. Like the above screen shot. Worked like a charm!